Inaugural Competition and Masterclass for student organists. The Cambridge Academy of Organ studies offers a range of events aimed at promoting the playing and study of pipe organs built on historic principles. Click on the links to the left to explore some of what we have done. Competition and Masterclass for student organists. The winner of our inaugural competition by unanimous decision of the jury was Andrzej Malitowski, a second-year graduate student at the Royal Academy of Music who receives a prize of £500 and a lunchtime recital at St John’s Smith Square. The adjudicators were David Titterington and Bine Bryndorf with Paul Binski (Chairman of CAOS) as Chair. Six students took part, from the University of Cambridge, the Royal Academy of Music and Royal Birmingham Conservatoire including four studying at postgraduate level from the USA, Australia, Poland and Germany. The standard of playing was very high, attracting praise from the jury. The formation of professional organists today requires in-depth knowledge of historical styles. An integral part of the competition was to play on two instruments in contrasting styles, a modern eclectic instrument and one in a historical style. 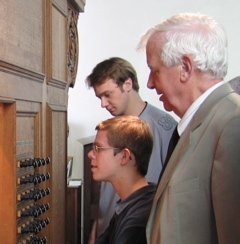 The competition was held at Jesus College on the modern two-manual organ by Kuhn of Switzerland (2007) and the ‘Sutton’ organ in historic English style built by Bishop & Sons (1849) and restored by William Drake (2012). 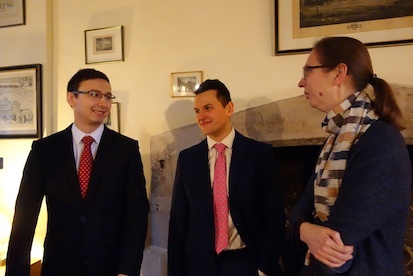 Left to right: Andrzej Malitowski, Marko Sever and Bine Bryndorf at Jesus College. The competition offered a public platform for organists approaching the end of their formal studies to perform to two distinguished musicians who are leaders in the international organ world. A chance to work with these renowned teachers in perfecting their art was offered by the masterclass the following day. Six students were taught by Bine Bryndorf on the organs of Sidney Sussex College, a new two-manual Flentrop and single-manual Taylor & Boody in North German style. Asher Oliver and Mariëtta van der Tol at the Taylor & Boody organ in Sidney Sussex College Chapel. This year's course was extended by an extra day to allow more time at each organ, the Merklin in Moulins Cathedral and the Clicquot organ in the abbey of Souvigny. The students' experience of playing on two important historic organs under the expert guidance of their titular organists was shared with a numerous public in two concerts which completed each part of the course. Repertoire for Moulins was drawn from the composers Lefébure-Wély, Vierne and Augustin Barié; for Souvigny from de Grigny and Lasceux, giving a taste of earlier and later styles. Following the British Institute of Organ Studies' 40th anniversary celebrations in Cambridge, CAOS Chairman Paul Binski and organist Anne Page led delegates on an 'organ crawl' around three different instruments, with comments on the chapel architecture and a short recital of music suited to the style of each organ. Pembroke College, Peterhouse and Downing were visited. This annual course once again proved popular with organists keen to experience French music on original instruments from 1783 (Clicquot at Souvigny) and 1880 (Merklin at Moulins). Repertoire for Moulins was drawn from works by Boëllmann, Widor and Guilmant (who gave the inaugural recital on the organ of Moulins Cathedral). Souvigny comprehended earlier and later periods of the French tradition with Nicolas de Grigny and Claude Balbastre. Participants' concerts on both instruments were well attended. A class open to the public with audio link from the organ loft, where organ scholars presented works by Howells and Whitlock. Stephen Cleobury's teaching of the repertoire on one of the organs most suited to it made this an exceptional event, just in advance of a major rebuild for the instrument. 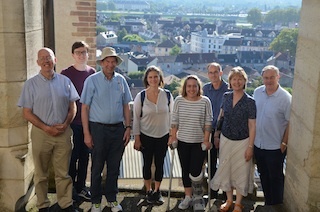 This course on the historic organs on Souvigny Priory and Moulins Cathedral was full to capacity this year with all active places fully subscribed and a number of observers also able to benefit from insights offered by the instruments, under the guidance of their Titulaires. Pieter Dirksen brought his expertise as editor of the new Breitkopf Bach and Sweelinck editions and his musical insights as a performer to teach both repertoires in a two-day event. The organs of Trinity College (Metzler), Sidney Sussex (Taylor & Boody) and Magdalene (Goetze & Gwynn) were used, and event was in association with the Organ Scholars' Forum. 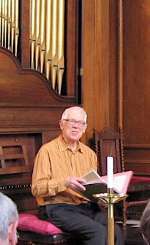 Experienced organists took part as well as students and all classes were open to the public. Courses on two outstanding historic instruments situated within the same region in France offered a chance to study a range of repertoire from the classical through the romantic periods. The courses could also be followed independently. Clicquot organ (1783) of Souvigny Priory — August 24–27. Merklin organ (1880) of Moulins Cathedral — August 27–29. Tuition (in French and English) from the Titular organists Jean-Luc Perrot, Pierre Dubois, Alexis Droy. Students were given five hours of classes daily with the chance for individual practice. Will Fraser of Fugue State Films presented a showing of the award winning DVD “The Organs of the Laurenskerk, Alkmaar” at Magdalene College in the afternoon. In it Pieter van Dijk and Frank van Wijk traced the history of the 1511 van Covelens organ in the Choir, which since its restoration is the oldest playable pipe organ in the Netherlands, and the world-famous Haberbeer/Schnitger organ at the west end of the church. Our Chairman, Professor Binski, outlined the shift from the needs of pre-Reformation Catholic liturgy to seventeenth and eighteenth century civic Calvinism succinctly relating them to both the artistic and functional development of the organs. He concluded with a brief view of post-WW2 influences of the interest in historic reconstructions of the repertoire in performance. Sweelinck to Bach Part 2 will be in November 2014 with the Dutch scholar and performer, Pieter Dirksen. Our thanks go again to The Master and Fellows of Trinity College and the Master and Fellows of Magdalene College with particular reference to the Director of Music, Jonathan Hellyer Jones, for their support. A study day led by Jennifer Bate, presented by the Cambridge Academy of Organ Studies and the Organ Scholars' Forum. In the morning session at Trinity Hall, Cambridge, attended by over 30 observers, Jennifer Bate gave an illustrated lecture on Messiaen's organ works. The extracts were accompanied by illustrations of Messiaen's scores for which Dr Bate's commentary and personal insights were essential for an understanding of the composer's intentions. Particularly telling for the afternoon's masterclasses was the way Messiaen combined the registration of the instrument with the acoustic of the building which housed it. The absence of such a perfect partnership available to many performers inevitably heightens the player's sensitivity to compromise. For observers and students alike the afternoon session in St John's College Chapel was an object lesson in how to achieve the best possible interpretation within the constraints an organist might find. The pieces prepared by the organ scholars were L'Apparition de l'Eglise éternelle (Joseph Wicks, St John's); Transports de joie from L'Ascension (Charles Gurnham, Fitzwilliam); Les Bergers (Theodore Hill, Pembroke), Les Enfants de Dieu (Ian Howard, Homerton), Dieu parmi nous (Ben Morris, Jesus) all from La Nativité du Seigneur; and Communion & Sortie from Messe de la Pentecôte (Ben Comeau, Girton). CAOS acknowledges the support of the Master and Fellows of Trinity Hall and the Master and Fellows of St John's College, with special thanks to Mr Andrew Arthur (Trinity Hall) and Mr Andrew Nethsingha (St John's College). An observer remarked "...a lovely group of people gathered together, and Jennifer Bate was wonderful with really enlightening advice, comments and stories. The standard of playing from the students was fantastic and it was such an enjoyable day in superb surroundings!" 1713 marked the birth of John Stanley, and the period during which Handel established himself in London. By 1813 (the year of William Russell’s death) organ music in England was “some of the most significant of that time in Europe” (Robin Langley). This repertoire is rarely heard on the type of instrument for which it was created and the course visited important historic instruments in Cambridge, East Anglia and London. In Cambridge Christopher Hogwood’s collection of historic keyboard instruments was open to the class. The course repertoire covered the Voluntary, the Concerto, arrangements and transcriptions, and duets. It will also examine the role of harpsichord and basso continuo to inform the interpretation of organ repertoire. Tutors: John Wellingham, Terence Charlston, Anne Page. Tuition in classes, lessons and practice opportunities. The outstanding instrument in the Priory of Souvigny built in 1782 by François-Henri Clicquot is the focus for a course which will be addressed principally to repertoire from the riches of the French classical school (c.1690–1790). A unique opportunity to play under expert guidance a rare Clicquot organ in a state of near-complete survival. Click here to find out more about the organ. 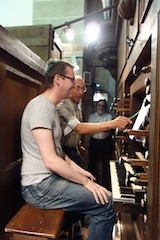 Tutors: Titular organists Pierre Dubois, Jean-Luc Perrot. Tuition in classes and practice opportunities. 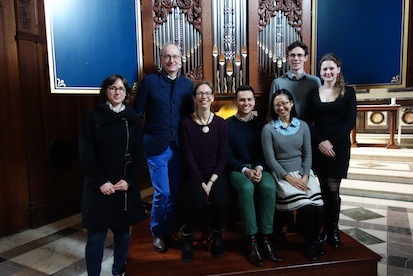 In collaboration with the Organ Scholars' Forum, this event took the form of a day-long public masterclass on the Carsten Lund organ of Trinity Hall. Special study topics this year took account of anniversaries of John Bull and Sweelinck (both born 1562) and John Stanley (born 1712) — there were afternoon sessions dedicated to studying the English Virginalists within a continental context and on the English 18th century. Bach also featured this year, as there were two free lunchtime recitals to attend as part of Anne Page’s complete Bach series. We welcomed James Parsons as a tutor, an experienced and inspirational teacher, and Pierre Dubois with rich insights into 18th century England. On 7 November, Guy Bovet, internationally known as performer, scholar, teacher and composer led a study of the music of Jehan Alain who was born in 1911. Guy Bovet has made an essential contribution to the story of the Alain family: having worked closely with Marie-Claire Alain he was instrumental in founding the Association Jehan Alain and in resurrecting the organ originally built in the family home by Albert, father of the musical dynasty, in Romainmôtier (Switzerland). Regular courses are held there and Guy Bovet will bring a film about this organ at which many of Jehan’s works first saw the light of day. The next day, as part of our Visiting International Professor programme, he gave five lessons to advanced students. Using new research presented in his recently published book, French Organ Music in the Reign of Louis XIV Dr David Ponsford offered fresh insights into this fascinating repertoire. He gave a talk illustrated with music followed by an afternoon master class covering the essentials of performance practice, the art of registration and the relation between music and language. In our Visiting International Professor programme, Susan Landale taught five students at the church of Our Lady and the English Martyrs. The repertoire was from the French Romantic period and the music of Petr Eben. Margaret Phillips led an in-depth study of Bach’s Orgelbüchlein on the Metzler organ of Trinity College. 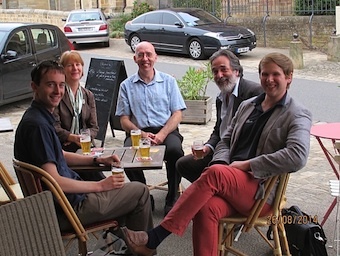 With tutors David Ponsford and Anne Page, this year’s summer course was entitled Music and the word and looked at the relation between music and text in organ literature. It included plainsong settings, the Catholic tradition beginning with Frescobaldi Chorale settings and works from the Reformed tradition beginning with Sweelinck, and continued through the centuries. The inaugural Visiting International Professor was Jacques van Oortmerssen, who gave lessons on works by JS Bach and Mendelssohn to a number of advanced students. With tutors David Ponsford and Anne Page, this course looked at organ music in England from pre-Restoration to modern times, which was taken in a broader European context to include influential foreigners such as Handel, Haydn and Mendelssohn, who all enjoyed great popularity in England and who co-incidentally all have anniversary years in 2009. This followed on from John Wellingham’s successful Dancing Hand event last November and used the H.C. Lincoln organ of 1821 in Thaxted Parish Church. The focus of the class was on repertoire suitable for this important historic instrument which awaits restoration but is of exceptional interest as the only surviving large organ from the Georgian period. Repertoire was drawn form the music of C. Wesley, S.S. Wesley, S. Wesley, Russell, Camidge, Heron and Stanley. This was led by John Wellingham, renowned as a charismatic teacher and performer of early organ music. It explored aspects of touch and articulation in early music with special emphasis on English repertoire. In the morning we used both the continuo and Metzler organs in Trinity college chapel, and in the afternoon the Snetzler in Clare, taking John’s invitation to “listen with your fingers” to explore the gifts of mechanical action, using music by Scheidt, Bull, Bach, Tomkins and Stanley. This was led by Christopher Stembridge and looked at Buxtehude’s organ music and its Italian influences. While the most obvious Italian influence on Buxtehude’s music is found in his vocal works, he was clearly conversant with the works of Frescobaldi and other Italian composers, as well as with those of German organists such as Hassler, Froberger and Kerll who studied in Italy. Buxtehude knew Weckmann, who, in turn, had known Froberger. The question of tuning and temperament was touched on; Buxtehude counted Werckmeister among his friends, which challenges the current vogue for assuming all North German organs remained in meantone. The Study Day began by looking at problems associated with the surviving sources of Buxtehude’s organ music. How far can we trust them? Which of the various modern editions should one follow? The master-class focussed on questions of interpretation as suggested by contemporary performance practice, including the evidence of the sources themselves. The final session explored the “Sonata” in the Yale manuscript E.B. 1688 in both its transmitted version for organ, and its possible string origins as suggested in a new edition by Geoffrey Webber. Session I: Democratizing Buxtehude: the performer as editor. Session II: Executing Buxtehude: the performer as composer. This was a class with Anne Page on English organ music of the Georgian and Regency periods, open to both players and listeners. The organ in Haslingfield church was originally built by J.C. Bishop in 1846 for Holy Trinity Paddington, rebuilt in 2001 by Peter Bumstead. It retains its original compass of GG below the usual bottom C. This gives a rare opportunity to study music written for this ‘long compass’ from the 18th to mid-19th century by composers such as Adams, the Wesleys, William Russell and Hook, Battishill. This class linked in with the free event later in the day at Thaxted Parish which was part of the Historic Organ Sound Archive project under the auspices of the British Institute of Organ Studies. The combined expertise of Gillian Ward Russell, David Frostick and Nicholas Thistlethwaite threw light on this important but neglected instrument and give a rare opportunity to hear it played. The organ dates from 1821, built by H.C. Lincoln for St John’s Bedford Row in London. It survives largely unaltered, with Great and Choir compass to FF, Swell to tenor e and Pedal FF-c. The third annual guided tour to organs in Cambridge by Anne Page and Professor Paul Binski visited Clare, St John’s and Magdelene Colleges. Although one of the oldest colleges in Cambridge, Clare Chapel is relatively recent (mid eighteenth century) and its west gallery organ more recent still, an austere 1971 baroque inspired instrument by von Beckerath, whose colours were well displayed in JS Bach’s O Gott du frommer Gott variations. Even more in keeping with the chapel, however, is the 1750s Snetzler chamber organ. Here our guides for the afternoon combined in an arrangement of the Hallelujah Chorus found by Anne in the University Library (John Marsh, 1783). St John’s Chapel is a contrast in style and size: the virtues of the large English romantic organ, renewed by Mander in the 1990s, in Scott’s High Victorian gothic chapel were heard in two short pieces by Carl Rutti and a blazing performance of Widor’s popular toccata. Finally, a further contrast. There is still something of the air of its Benedictine foundation in Magdelene College — its intimacy, some of its 15th century sets (the oldest continuously inhabited purpose built study chambers in Cambridge) and the small chapel housing the newest in date but oldest in style of the chapel organs visited, by Goetze and Gwynn. Two voluntaries by Boyce and Buxtehude’s Prelude, Fugue and Ciacona demonstrated some of its colours. The special study topic this year was French music — the grand narrative from French classical to Messiaen, with all stations in between, with tutors David Ponsford and Anne Page. Events included David Ponsford discussing his work on the forthcoming new edition of de Grigny, and performing part of Couperin’s Messe pour les Paroisses and elucidates Messiaen’s organ works. Anne Page gave a recital on the new Jesus College organ (by Kuhn) and on a Mustel harmonium and talks about the romantic century and early modernism in French organ music. The main focus of study was the Orgelbüchlein, and the detailed construction and practical application of the techniques were studied at the keyboard, with tutors David Ponsford, Anne Page. The course included recitals, an invitation to write a chorale prelude on a well-known hymn, and classes using the organs of Pembroke, Trinity and Emmanuel Colleges. The Cambridge Academy of Organ Studies presented three master classes — an opportunity for harpsichordists and organists to enlarge their knowledge of Bach’s keyboard music in the company of one of the world’s foremost authorities. Peter Williams is an internationally renowned Bach scholar and performer. He was Professor of Performance Practice and the first Director of the Russell Collection of Harpsichords at the University of Edinburgh, Arts and Sciences Distinguished Professor at Duke University NC, and until recently John Bird Professor at the University of Wales, Cardiff. He is the author of many books on the organ and its music including The Organ Music of J S Bach. He is also one of the Patrons of CAOS. Two harpsichord classes were be held in the Colyton Hall of Gonville and Caius College on the Mackinnon and Waitzman two-manual instrument after Pierre Danzelague 1711 and the organ class was held in the chapel of Trinity College on the organ of Metzler of Zurich (1975). CAOS’ third study day opened in the elegant setting of the Senior Parlour at Gonville and Caius College where over thirty participants attended a lecture by Jennifer Bate. Her extensive experience of working closely with Olivier Messiaen lent unique authority to her insights into both the technical and spiritual dimensions of his work, focusing on Le Livre du Saint Sacrament. Her introduction was illustrated by her own recordings and her own copy of the work with manuscript annotations made under the supervision of Messiaen. The subsequent discussion tackled, amongst other topics, the relationship between Messiaen’s theology and actual performance. The afternoon master classes took place in St John’s College Chapel, where difficult problems of interpretation and registration were faced and practical solutions offered. This was especially useful when attempting fidelity to Messiaen’s intentions on instruments which do not match his specifications. 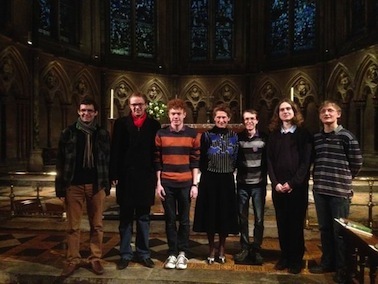 The participating advanced students, on this occasion existing and past organ scholars from the Cambridge colleges, prepared pieces ranging from the Communion and Sortie from La Messe de la Pentecôte, Offrande et Alleluia from Le Livre du Saint Sacrament, L’Ange aux parfums (Les Corps Glorieux), Alleluias sereins (L’Ascension) and Dieu parmi nous from La Nativité: Both students and audiences were able to share, via the sound and video link between the organ loft and the chapel, Jennifer Bate’s thoughtful, sensitive and authoritative analyses of performances. The whole day, both in its content and its settings, once again clearly fulfilled a need and answered the expectations of advanced professionals and listening enthusiasts alike. 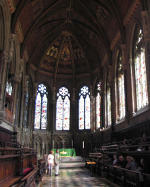 The Cambridge Academy of Organ Studies’ second Study Day in Clare College Chapel, Cambridge was given by Derek Adlam. He explored the influence of the clavichord on the performance of the organ music of JS Bach and his north German contemporaries. To an enthusiastic gathering of students, including organ scholars as well as professional and amateur musicians, he began by demonstrating how correct clavichord technique, especially the importance of the release of notes, animates phrasing and interpretation. His emphasis on the clavichord as the Instrument of Rhetoric was, by the end of the morning session, persuasively demonstrated on a short recital of JS Bach’s music. He gave supporting evidence of the fluidity and sensitivity demanded from the treatise of Dom Bedos, calling as evidence the “recording” on paper of a performance by Balbatre. During the masterclasses, performers, many of whom had never played a clavichord before, made the most of the chance to move from Mr Adlam’s Hass instrument to the chapel’s 1752 Snetzler chamber organ, applying a new physical as well as mental approach with evident pleasure to the pieces they had prepared by JS Bach and JG Walther. The inaugural event of the Cambridge Academy of Organ Studies, in association with the Royal Academy of Music, took place on May 22 in Emmanuel College Chapel, Cambridge. Dr David Ponsford presented a lecture-recital on the recently-published organ works by Louis Couperin, placing them in context and playing a substantial selection from this important collection. Dr Ponsford, a former organ scholar of Emmanuel College, distinguished recitalist and recording artist on both harpsichord and organ, and Associate Lecturer in Performance Practice at Cardiff University, has recently been awarded a Leverhulme Research Fellowship to pursue his studies into French Classical organ music. The afternoon was devoted to a master class on music from the French Classical school: four advanced players, including two students from the RAM, performed movements from Couperin’s Messe Pour les Paroisses Grigny’s Livre d’Orgue.